The Samsung Galaxy Note II has finally been made official by the South Korean tech powerhouse. In a pre-event announcement at the IFA conference in Berlin, Samsung unveiled the Galaxy Note II packed with an even more bigger screen that its predecessor, the original Galaxy Note. The smartphone features a 5.5-inch HD Super AMOLED screen with 720p (1,280 x 720 pixels) resolution. Giving the processing power of the Galaxy Note II is its Exynos 4 Quad processor clocked at 1.6 GHz and a Mali-400MP graphics processing unit. Yes, this is the Exynos 4412 Quad and in case that name has not yet made it apparent, it is a quad-core processor. The Exynos 4412 Quad in the Galaxy Note II makes use of Cortex-A9 cores for those who may want to know. The Galaxy Note II will ship with Android 4.1 Jelly Bean installed but it will be skinned with Samsung’s TouchWiz. It features two cameras: an 8 Megapixel Auto Focus rear camera with LED Flash and a 1.9 Megapixel VT front camera. Both of these cameras support Best Photo, Best Faces, Low Light Shot features. Video recording for the Galaxy Note II is at a full-HD 1080p and it can also play 1080p videos thanks to that quad-core CPU and powerful GPU. As a side note, the new smartphone/tablet can play 3GP(MP4), WMV(ASF), AVI, FLV, MKV, WebM videos encoded with these codecs MPEG4, H.263, H.264, VC-1, DivX, WMV7, WMV8, WMV9, VP8. Those waiting for a smartphone that plays MKV files encoded with the H.264 codec with its native video player have found their smartphone. “Last year at IFA, we launched the GALAXY Note, which opened a new category of smart mobile devices. 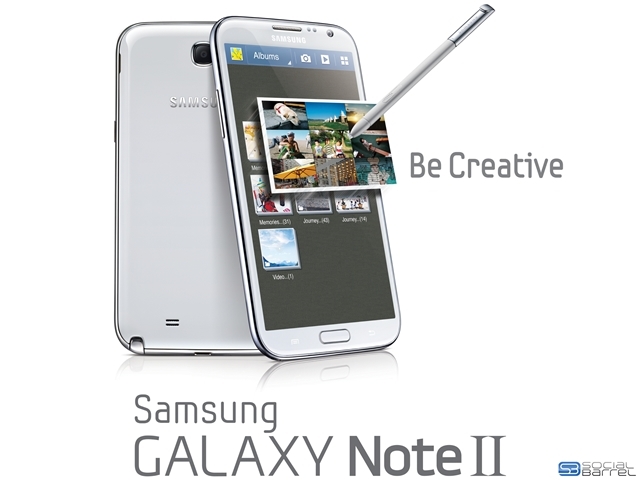 This year, again at IFA, I am proud to announce the GALAXY Note II, which will encourage users to ‘unleash their inner creativity,’” Samsung’s JK Shin said. “With a perfect viewing experience and unique and differentiated features, users can discover information and capture their ideas faster, express thoughts freely and manage tasks more efficiently,” the President of IT & Mobile Communications Division at Samsung Electronics added. “For anyone who wants to be creative, expressive and unique, the Samsung GALAXY Note II will be the ideal device, allowing users to live a life extraordinary,” he said. As with the original Note, the Galaxy Note II still has an S-Pen but it is now thicker and longer making it easier to hold. Furthermore, this S-Pen now has more features. One of the most notable ones is Air View where a user can hover the S-Pen of the Galaxy Note II over an app or file (email, video, gallery, etc) and then preview the content without launching the app to open the file. The S-Pen also enables Quick Command which uses gestures to launch frequently opened or designated apps. Other S-Pen features are Popup Note, Popup Play (which we first saw in the Galaxy S III), S Note, S Planner, Email with hand-writing integration, Easy Clip, Photo Note, Paper Artist, Shape Match, Formula Match, and Idea Visualizer. Notably, the Galaxy Note II shares the same design cues as the Galaxy S III superphone. This is a welcome move from Samsung as it will be harder for Apple to argue they copy the iPhone with designs that are distinctive. The Galaxy Note II is a 4G LTE device operating at 700MHz Class 17 and at 2100 Mhz. Its download speed is 42Mb/s via HSDPA and 100Mb/s via LTE and its upload speed is 5.76Mb/s via HSUPA and 50Mb/s via LTE. Over-the-air communications are also taken care of by Wi-Fi a/b/g/n dual-band, Wi-Fi Direct, DLNA, Bluetooth 4.0 with Enhanced Data Rate and NFC. The Note II can act as a Wi-Fi Hotspot. Internal memory will be offered in 16GB, 32GB and 64GB options, all of which can be supplemented via a microSD card (up to 32GB). Another thing that can be supplemented is the Galaxy Note II battery, already massive at 3,100mAh but can still be replaced as the back cover of the smartphone is removable. The Galaxy Note II will be available in October first in Europe with worldwide rollout expected shortly after. Look after the break for the official specifications sheet supplied by Samsung for the Galaxy Note II.